Recently I was contacted by a certain Hassan, husband of new artist Shahla Rezvani. He wanted to send me a new album to review. I didn't think much of it, it seems that Iranians are at a phase where books and music are flourishing like never before. I have another album and 3 books to review after this! And I have to tell you, it's a great pleasure to see this. You don't know how sick of technology I am, especially after last year! I think if I hear one more story about one more Iranian electrical engineer making it big in a bio-tech startup, I will toss my tahdeeg! So sending me something nice to review like a book or a new album is a complete pleasure. When I received the album, as expected from the title [Cheshman-e-Siah, Dark Eyes] there were the prerequisite pictures of eyes on it. But there was a simplicity and genuineness in the eyes (which I later learned were pictures taken of Shahla herself), that I was unexplainably drawn to. As always, I waited until the next morning and popped the CD in my truck to listen to during my 40 minute commute to the very belly of the beast, the place I hang my shingle, Silicon Valley Hillbillies, Swimmin' pools, IPO stars! My technique is not sophisticated, I scan through the album first, looking for gems, and then when I find them, I focus on those for a while, then give the whole album a proper listening to from head to toe. As I scanned the album, I heard a familiar sound that I had not heard since Tehran 1977. It was on (the then named) Pahlavi Avenue in the late spring afternoons, where me and my friends would hang out, that special place just below the FBI (Foroushgah-e-Bozorg-e-Iran) and Chattanooga restaurant, just a nudge away from Aleeghapoo. The happeningest place in all the world (at the time.). Girls in short black miniskirts sat dangerously side saddle on their boyfriends' Honda 750's that screamed up and down the main boulevard. The album took me back, and at first I thought that this must have been recorded back then and somehow lost in the mad rush of the pop exodus of the revolution. Resurfaced it was now being re-issued for a glory it never had the chance to enjoy. That's what I thought. A full 3 days later having listened to it non-stop, I finally had to know and called up Shahla's husband Hassan to ask about the album. It is not a throwback lost album as I had thought, but completely original material except for the Russian standard O'chin Chorneya which is refreshingly sung in Farsi as "Cheshmaan Seyaah" (there is a full Russian version at the end), and a farsi version of "Lullaby" which I am sure Iranian mothers have been dying to sing to their kids. Now you can! My absolute favorite is "Baavar Kon" which is one of those songs that you daydream about driving to Shomal or Dizin (Sniff! Ah! I can smell the Mahi Kabab at Lashgarak!) and you cannot get the main chorus out of your head. Followed by "Hamraaz" make a great back to back pop set. Did I mention dat da girl got pipes? Shahla has an incredible range; from a deep and dark haunting whisper on "To Begoo" to an almost childlike voice on "Zaghikner" (Armenian). 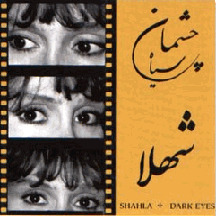 Shahla sings in 4 languages on this album which sounds like an incredible feat, except that she grew up that way which explains the ease at which she accomplishes this. But it's all so fresh! Masterfully arranged by Manouchehr Cheshmazar (we are not worthy! ), the support textures of each song are almost perfect. On "Zaghikner" you can almost smell the cafe au lait on a Paris streetside cafe as the accordion and flute play. There is a healthy blend of what in my old age I like to call "real" instruments with the electronic ones we have become numb to. Flutes, cello and all surrounded and enveloped by Shahla's powerful distinctive voice. You would again be surprised by Shahla's voice except when you find out that she was classically trained since 9 and won numerous singing awards when she was in Iran. There is a genuine compassion in her voice that comes through in this album. Maybe because it's her first one or maybe it's because she really believes in these songs, or maybe it has to do with the fact that in her real life Shahla is a social worker helping people in the San Francisco Bay Area.. Either way and for any reason you like, you can't deny this is a pretty good album for a first timer. I can't wait to see what she comes up with next. Thanks to hubby Hassan for helping me discover Shahla!